While the ubiquitous PET bottles used for water or pop often get a bad rap, the used bottles are being upcycled in poorer parts of the world as part of roofs. I have two recent examples which are very different. 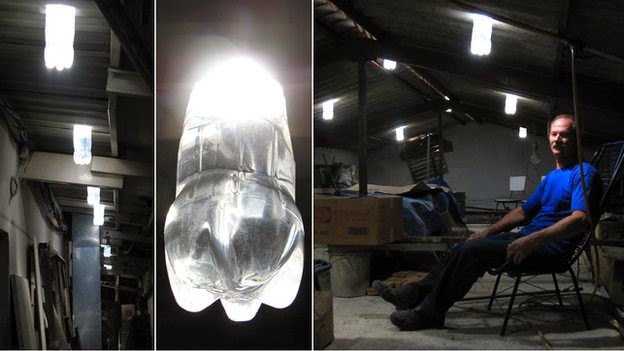 The first uses the bottles as an internal light source. The bottles are filled with water (a touch of bleach to prevent microbial growth) and then placed in a hole cut into the metal roofing material. After being sealed into place, sunlight is collected by the upper part of the bottle and diffracted throughout the living quarters below providing the same light as a 40- to 60-watt incandescent bulb. This ingenious invention reduces or eliminates the need for electric lighting during the day, with just short of a million such lights installed in numerous countries. 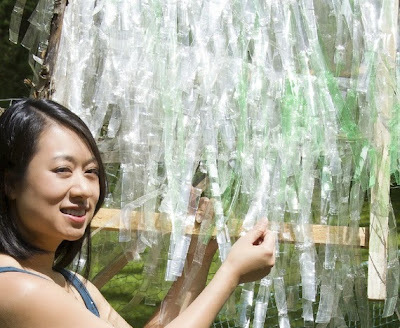 A more recent invention also upcycling PET bottles involves cutting the bottles into strips and ultrasonically wleding them to create a thatch roof alternative. While lacking the simplicity of the previous innovation, it still is an improvement over the current materials being used - grass thatch and corregated tin roofs in that it allows plenty of light in while keeping rainwater out. This project is just starting up so the number of installations is much smaller, but I hope the project is successful. It certainly looks promising. June 25, 2013 - Polymetallocenes. Not Metallocene Polymers, but Polymetallocenes. Without a right roof substitute, your own home receives damaged along with your roof right away, now not simplest serving as a notable annoyance, however additionally as a huge hit to your wallet as properly. Right here at 2nd2None Roofing& Construction, as a leading roofing organization in Huntsville Alabama, we undertake to provide you the first-rate roof alternative services round.